5 backscattering and surface reverberation. Urick (1982: chapter 10) provided a comprehensive summary of sound reflection and scattering by the sea surface. Items (1)-(3) will be discussed below. Item (4) will be addressed in Chapter 6 and item (5) will be discussed in Chapter 8. The mechanisms operating at the sea surface can be incorporated into mathematical models through the specification of appropriate "boundary conditions." 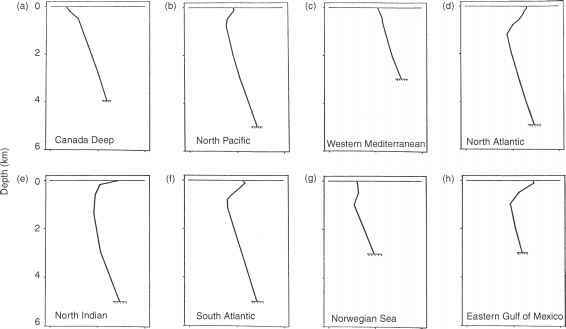 These boundary conditions can range from simplistic to complex depending upon the sophistication of the model and the availability of information concerning the state of the sea surface. When a plane sound wave in water strikes a perfectly smooth surface, nearly all of the energy is reflected at the boundary in the forward (or specular) direction as a coherent plane wave. As the sea surface roughens under the influence of wind, sound is also scattered in the backward and out-of-plane directions, and the intensity of sound reflected in the forward direction is accordingly reduced. The backward-directed (backscattered) energy gives rise to surface reverberation (see Chapter 8). Eckart (1953) developed a theoretical treatment of scattering by a sinusoidal boundary as a way to approximate reflection from a wind-roughened sea surface. Marsh etal. (1961) developed simple formulae to express scattering losses at the sea surface. Eller (1984a) reviewed the availability of simple surface loss algorithms appropriate for incorporation into propagation models. The sea surface is most commonly modeled as a pressure release surface (see Kinsler et al., 1982: 126-7). This is a condition in which the acoustic pressure at the air-water interface is nearly zero, the amplitude of the reflected wave (in water) is almost equal to that of the incident wave, and there is a 180° phase shift. This is also known as the Dirichlet boundary condition (Frisk, 1994: 32). It is also common practice to use the term "reflection coefficient" to express the amount of acoustic energy reflected from a surface or from a boundary between two media. 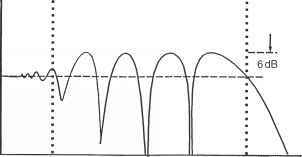 This coefficient depends upon the grazing angle and the difference in the acoustic impedance between the two media. A reflection loss is then defined as 10 logj0 (reflection coefficient). 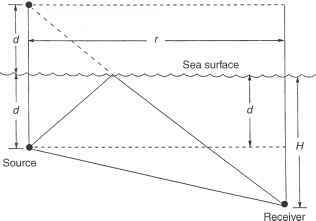 This reflection loss is referred to as "surface loss" when describing the reflection of sound from the sea surface or "bottom loss" when describing the reflection of sound from the sea floor. R ^ 1, the sea surface is considered to be acoustically smooth; when R ^ 1, the sea surface is acoustically rough. Sea-surface wave spectra can be generated numerically by executing available spectral ocean wave models in the hindcast mode. Hindcasting is usually the only means available for obtaining sufficiently long record lengths from which to generate reliable statistics. A statistical analysis of these hind-cast data produces probability distributions of critical parameters for use in estimating future sea-surface conditions. Kuo (1988) reviewed and clarified earlier formulations of sea-surface scattering losses based on perturbation methods and also presented new predictions based on numerical integration in a complex domain. When the surface is smooth, an interference pattern is produced between direct-path sound and sound reflected from the sea surface. The sound reflected from the sea surface may be considered to originate from an image source located on the opposite (mirror image) side of the surface (Figure 3.8). This image signal will have an amplitude nearly equal to that of the incident signal, but will be out of phase. The resulting sound field can be divided into three parts (Figure 3.9): (1) the near field close to the source in which the image source is too far away, and the reflected sound is too weak to produce appreciable interference; (2) an interference field in which there are strong peaks and nulls in the received signal as range increases; and (3) the far field in which there is an increasingly out-of-phase condition between the source and image, and the intensity falls off as the inverse fourth power of range. Figure 3.8 Geometry for image interference effect.